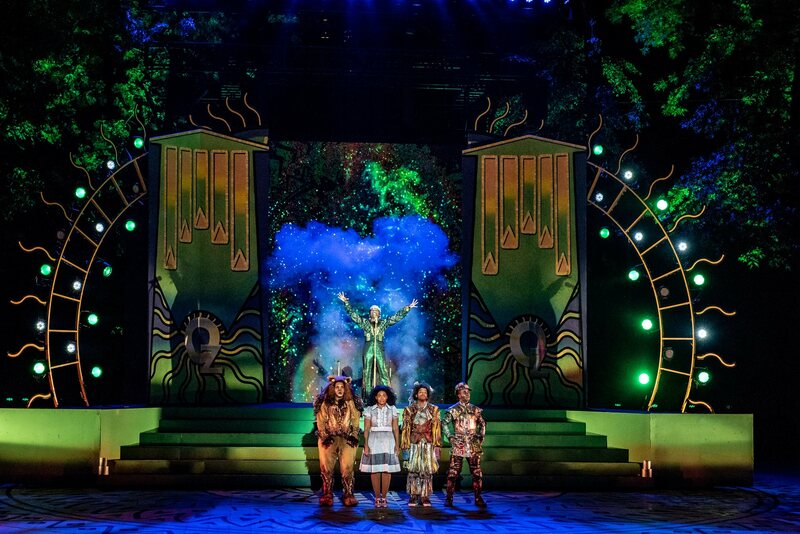 For the first time in 36 years, The Wiz has returned to The Muny! 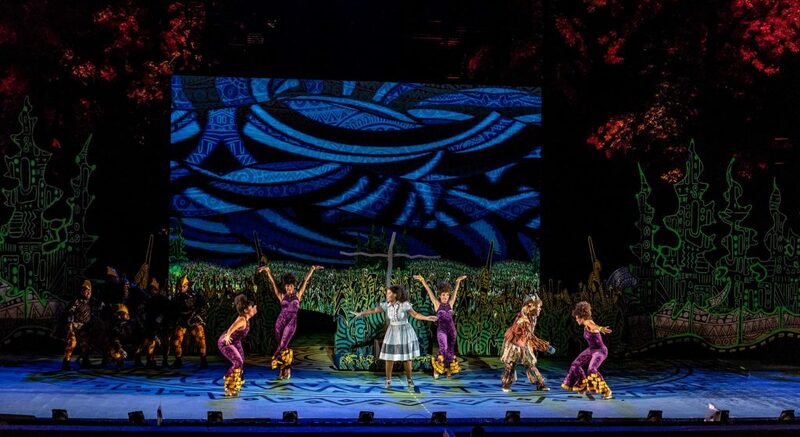 Based on L. Frank Baum’s most cherished book – “The Wonderful Wizard of Oz” – The Wiz is a wildly fun and imaginative update to the classic story. The show opened on Broadway in 1975, winning seven Tony Awards – including best musical. And now audiences in St. Louis can enjoy this magical show under the stars, on the magnificent Muny stage. By now you surely know the story. 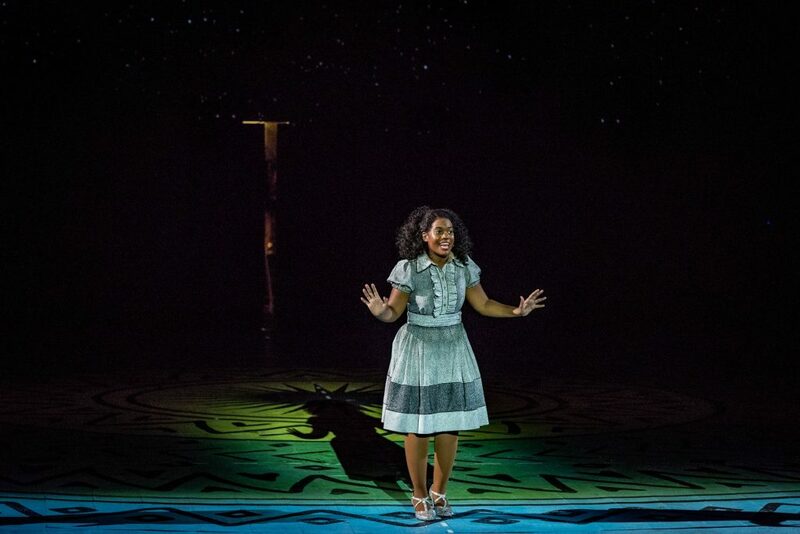 Dorothy (Danyel Fulton) is swept away in a tornado from her Kansas home, transported to the land of Oz. There she meets the Munchkins, who tell her that she has just landed on The Wicked Witch of the East. 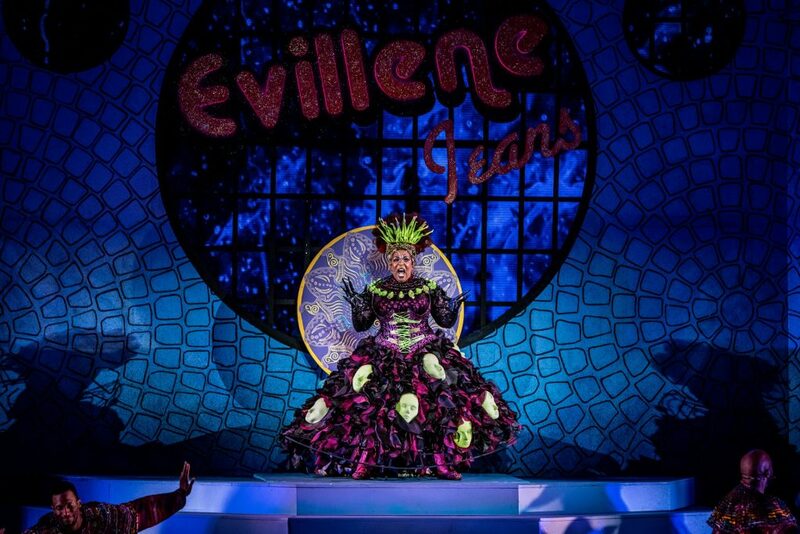 The newly departed’s sister, Addaperle (E. Faye Butler), gives Dorothy the dead witch’s magical shoes and sends her to find The Wiz (Nathan Lee Graham) – who can help her get back home. On her journey, she meets the Scarecrow (Jared Grimes), Tinman (James T. Lane), and Lion (Darius de Haas). The four new friends make their way to the Emerald City, while trying to avoid The Wicked Witch of the West – Evillene (also Butler). The Wiz will light up all of your senses, from the brightly colored costumes to the fantastically upbeat songs and dances. As soon as we get to Oz, we are hit with the magnificent costumes of Leon Dobkowski. The Munchkins are dressed head-to-toe in colorful animal prints and plaid, with striped socks and cotton-candy hair. Their outfits scream fun – and perfectly represent what we expect from these characters. When we get to the Emerald City, the cast is once again dressed in a wild array of fantastic costumes, beautifully put together in the theme of green. And the Poppies are no longer just flowers. They are dancers dressed in intricately designed red costumes, full of personality. After leaving the Munchkins and The Good Witch of the North, Addapearle (personified as a lovable, wise-cracking, amateur magician), Dorothy follows the yellow brick road dancers to meet the Scarecrow, Tinman, and Lion. I love how so many of the physical objects in the original story are played by people in the show. When Dorothy is swept away by the tornado, there is a great dance scene choreographed by Camille A. Brown – where the natural disaster is embodied by dozens of dancers. It’s a fun story-telling device that wonderfully fits the musical. As previously mentioned, The Poppies are also very fun as actual characters. The show really kicks into high gear when Dorothy meets her three new friends. I was blown away by the endless charisma radiating from Jared Grimes as The Scarecrow. The actor has a terrific voice and stage presence – as well as comedic timing – and lights up the stage with every line. And there is nothing robotic about James T. Lane’s magnificent portrayal of the Tinman. His body language says it all as he brought back to life by Dorothy in “Slide Some Oil to Me.” And if there’s anything that his meticulously crafted dance moves left unsaid, his beautiful vocals make sure to tell the story. And Darius de Haas is hilarious, while always loveable, as the cowardly Lion. All three of the actors are tremendously talented and perfectly cast in their respective roles. Danyel Fulton shines brightly on the star-lit stage as Dorothy. Playing the innocent teenager who has been swept far away from her home, the actor marvelously captures the curiosity and kindness which makes up the iconic character. And her voice is stunning, as the songs range from soft and beautiful to loud and powerful. Fulton has the entire package, singing and dancing while making new friends as the sweet yet capable Kansas girl. The Wizard of Oz, known as The Wiz, is funky and fabulous – played by the exuberant Nathan Lee Graham. His portrayal is a mixture of Prince and James Brown, in what amounts to an endlessly entertaining character. My only complaint is that he was sometimes hard to understand as he was singing so quickly. Yet his performance never ceased to come off as larger than life, paired with his dazzling costumes and impressive pyrotechnic effects. The Wizard is complex, in that he is a character also playing a character of his own. And Graham really nails both sides. E. Faye Butler plays both the Good Witch of the North and the Wicked Witch of the West. Yet the actor has much more to do as Dorothy’s foil, and ramps up the performance all the way to living and breathing Disney-esque villain for the role. Her voice takes on qualities of Eartha Kitt, only deeper and raspier. And it works remarkably well for the nefarious character. In this version of the story, Evillene is the unforgiving boss of “Evillene Jeans,” who is constantly mistreating her employees. It gives her a humorous agenda, other than just simply being wicked. Butler is delightfully devilish in the role. The practical sets designed by Edward E. Haynes Jr. are breathtaking and mesh perfectly with the digital effects. There are so many fantastic colors that pop right off the stage, yet they never send the audience into sensory overload. Everything about the show is mesmerizing, making it impossible not to instantly get sucked in to the land of Oz. 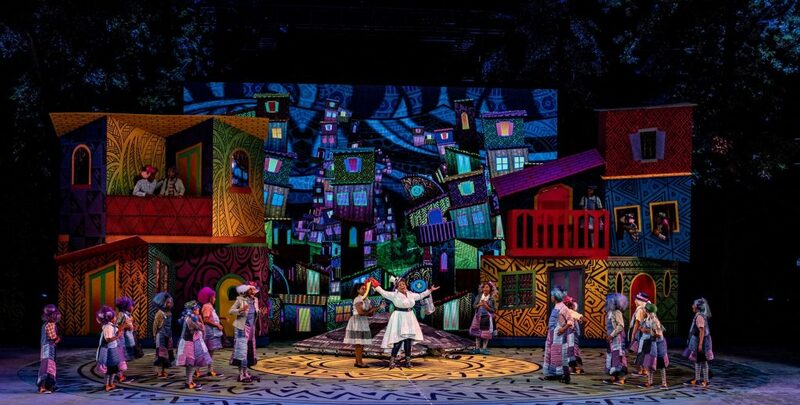 The Muny makes full use of the giant video screen at the back of the stage, with gorgeous video backdrops designed by Greg Emetaz. And I loved the way Dorothy and her friends would “Ease on Down the Road” via the stage extension that came out and around the orchestra. It was really neat to see the characters singing and dancing almost in the audience as they came out from the stage. Conductor Darryl Archibald leads his musicians during their beautiful rendition of his new orchestration. The score sounds terrific throughout the entire performance, further livening the mood of a show that is already bursting at the seams with joy. There is so much to take in during The Wiz, from the breathtaking costumes to the vibrant sets and endlessly fun songs. Everything comes together so splendidly, making it the most fun adaptation of the classic story to date. 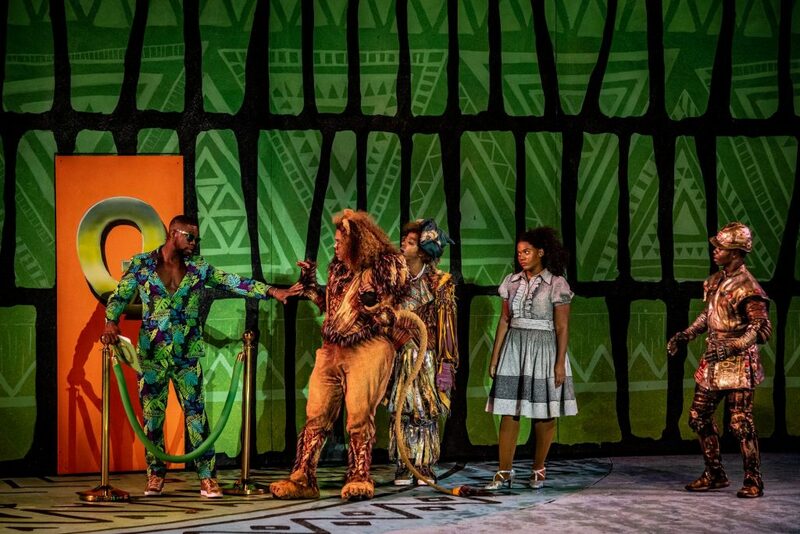 There are plenty of jokes – many of which are a play on the classic musical (a production of which was actually created for The Muny in 1942) – but most importantly, there’s a never-ending supply of heart. Come for the upbeat songs and colorful characters, and stay for a story about friendship and believing in yourself. 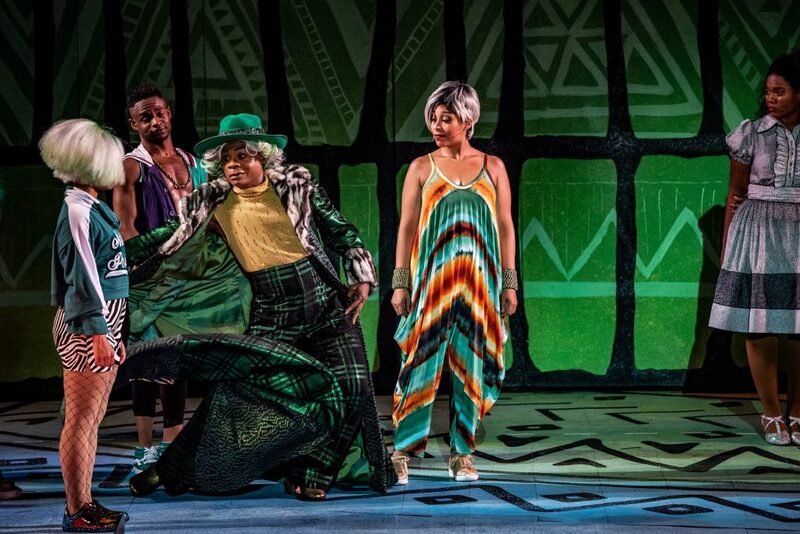 The Wiz is currently playing at The Muny through June 25. Tickets are available at MetroTix. For more information about the show, visit Muny.org.